In Washington, D.C., “military reform” usually means “acquisition reform.” There is a lot of talk about it on Capitol Hill and in the Pentagon. Enough think-tank papers have been written on the subject to clear whole forests. But of the myriad options out there, one has escaped notice. Performance bonds — money put up by a contractor as insurance to the buyer to make sure the job is done on time and to specifications — are already required for federal building projects under the Miller Act. Prime construction contractors have to furnish a surety to the government to ensure their work is completed properly and to guarantee all subcontractors get paid should the firm go out of business. The same idea could potentially be applied to a weapons acquisition project to protect the government’s — and the taxpayer’s — interests. But it has so far been overlooked during the sometimes desperate search for solutions to the Pentagon’s dysfunctional buying process. One key selling point for this idea is that provisions for using performance bonds for Defense Department acquisition already exist. As is usually the case, improving discipline in weapons spending doesn’t require new rules but using the rules that already exist to better effect. The collapse of the Soviet Union and the end of the Cold War put defense contractors across the world in a tight spot. The two greatest superpowers were no longer casting nervous glances at each other across the Fulda Gap. For a time in the 1990s, there seemed to be little interest among most nations to arm themselves to the teeth. Weapons manufacturers found themselves with plenty of products to sell, but with very few people interested in buying. Those nations that were still in the market for high-end military equipment were in an excellent position to extract the best terms possible. Officials from the United Arab Emirates understood this and encouraged a rigorous competition between the world’s defense contractors when they said they wanted to purchase new fighter planes. In doing so, they were able to acquire the planes they wanted — world-class fighters with cutting-edge offensive and defensive electronic systems — at the price quoted to them and on the challenging delivery time line specified when the contract was signed. Contractors were also able to assure them that the plane’s stressing performance requirements would be met and that the Emirates wouldn’t have to pay for any promised capabilities that went undelivered. When the United Arab Emirates began shopping in earnest in the early 1990s, several international firms offered designs including the Eurofighter Typhoon, the French Rafale and the Boeing F-15E. But the Emirates liked one design in particular, Lockheed Martin’s F-16. It first sought to purchase the jet in 1981. In the end, the intense international competition forced each of the competitors, including Lockheed Martin, to offer new, more advanced versions of what they already had in production for domestic or export use, tailored to a demanding set of requirements. U.S. officials were eager to ensure an American firm received the $6.4 billion contract. Lockheed Martin had plans at the time to lay off 1,000 employees from its fighter plane assembly plant in Fort Worth, Texas, incentivizing the Texas Congressional delegation to make sure nothing interfered with the deal. Then-senator Kay Bailey Hutchison and current Fort Worth representative Kay Granger, both Republicans, promoted the deal. Vice Pres. Al Gore was part of a White House team that actively encouraged the UAE to select the F-16. The UAE, like defense contractors and military services here, certainly understands how influential political engineering is in the United States. Everyone can now visit the UAE embassy website to see an interactive map showing the number of jobs the UAE claims their investments create, as well as the dollar figure of exports from each state. It even provides downloadable reports for each state giving detailed information for the economic impact the UAE has had on that state. It should hardly surprise anyone to see such information helpfully broken down by Congressional district. Lockheed Martin won the contract by agreeing to develop a unique version of the F-16 to meet the UAE’s strategic needs. The small country believes it is threatened by Iran across the narrow Strait of Hormuz. To meet this threat, Lockheed Martin designed upgrades like larger fuel tanks to increase the plane’s range and an Agile Beam Radar — the first active, electronically-scanned-array fighter radar ever delivered to non-U.S. customer — to track the multiple targets a larger enemy force could potentially present. Lockheed Martin also fitted the aircraft with the brand new defensive electronics suite, an advanced system designed to the UAE’s unique and very challenging requirements. To make sure they got what they wanted, the UAE secured a $2-billion performance bond provision “available for draw down in the event of the corporation’s nonperformance under the contract” once the deal was finally inked. But it appears Lockheed Martin ended up forfeiting approximately $300 million of its bond money for this program based on details hidden within its annual stockholder reports and SEC filings. Lockheed last mentioned the F-16 deal in its 2012 annual report. That year Lockheed Martin used rather opaque language to report its performance bond obligations to its shareholders. The company reported having set aside $3.9 billion to guarantee performance at the end of 2011, which was then reduced to $2.2 billion by the end of 2012. Following the money in the intervening years is a bit difficult. In its annual reports from 2001 to 2007, Lockheed Martin repeatedly listed $2 billion in letters of credit for the F-16 deal. In the 2008 report, this changed to $1.8 billion in letters of credit issued for the same purpose. The 2009, 2010, and 2011 reports list the same amount set aside for the same purpose without giving an explanation for the $200-million reduction before finally settling the matter with an additional $100-million reduction in 2012. Lockheed Martin began delivering F-16s to the UAE in the summer of 2005 and had completed the order by 2007. By 2008, UAE officials had plenty of time to determine whether or not their new planes met the performance specifications and to arbitrate any payments. By adding up the figures, it appears Lockheed Martin ended up paying $200 million in 2008 — reducing its letters of credit from $2 billion to $1.8 billion — and then $100 million in 2012, settling a $1.8-billion letter of credit for $1.7 billion. Given that the aircraft were delivered to the UAE on time, no late penalties should have been imposed, so it seems that the charges against the performance bond must have been compensation for unmet requirements. In other words, in the areas where Lockheed Martin failed to deliver, the UAE didn’t pay. Lockheed Martin does not provide an explanation for the differences in the figures. POGO reached out to both Lockheed Martin and UAE officials for comment. Both were asked to confirm or deny the specifics of the contract, including the amount Lockheed Martin forfeited due to non-performance. Both declined to respond. Could performance bonds be used for weapons purchases in the United States? Performance bonds are most commonly used by the federal government for construction projects to ensure the contractor builds what they said they would and finishes on time. In typical cases, after the contractor is selected and the terms of the contract are fixed, the contractor will secure a performance bond in the form of cash or a letter of credit held by a third party. As long as the contractor fulfills all the obligations of the project the bond becomes null and void. But should the contractor fail to “perform the obligation stated in the bond, both the principal and the surety are liable on the bond. That is, either the principal or surety or both may be sued on the bond, and the entire liability may be collected from either the principal or the surety,” according to guidance on performance bonds in construction contracts published by the Fullerton Law Center. The amount forfeited in the event of non-performance is called the penal sum. They might do that, but they could invite opportunities for unscrupulous government officials to curry favor with a potential private sector employer by awarding such fees when they are not deserved. And contracting officers have historically been very generous in handing out award fees. One Government Accountability Office study found that contractors received the full payout 90 percent of the time. Again, a tool is only effective so long as it is being used correctly. The Project on Government Oversight, or POGO — where I work — could not find any example of the Department of Defense using performance bonds in a weapon acquisition program, although the Department has used them for service contracts. But just because this tool hasn’t been used to buy weapons doesn’t mean it can’t in future projects. The provision lists four such situations including when “substantial progress payments are made before delivery of end items starts.” Because defense contractors do receive progress payments, it is this situation which is most applicable. The regulations go so far as to provide the language to be added to a contract when using a performance bond. And because nothing is official in the government until a form is filled out properly, someone created Standard Form 1418. Performance bonds could be used in conjunction with award fees to create a carrot-and-stick effect. Award fees already provide a means to reward good performance. A bond would give the government a means to punish substandard performance. Using both tools together could help ensure that the interests of both sides, government and industry, are best served. But as is true of any contract tool, the key would be how they are used by the people involved in the process. On the surface, the idea of using performance bonds looks like merely a good way to hold defense contractors accountable. But performance bonds can encourage all parties to the agreement to behave better. Bad behavior is most evident at the beginning of a program when decisions are being made about what a new system should do. The government behaves badly when officials fail to set achievable and steady goals for new system. Defense contractors behave badly when they then say they can deliver the desired system by providing rosy cost and schedule estimates. Frank Kendall, the Pentagon’s chief weapons-buyer, acknowledged as much when he said that the government must begin any program by creating reasonable requirements for a new system. He went on to say that the current system rewards “optimism,” saying it is easier to gain Congressional support for a program when it is presented as cheaper and can be delivered faster than the competition. This provides powerful incentives for defense contractors to present unrealistic proposals. A list of specific, measurable, and stable requirements should be a part of every acquisitions program. Air Force Secretary Deborah Lee James cited changes to requirements as a major source of cost increases to the B-2 program and vowed to maintain “very specific discipline to keep requirements stable” during development of the B-21 in an effort to keep from breaking the budget. Using a bond could help maintain that discipline by forcing the government to establish performance standards, which “shall be measurable and structured to permit an assessment of the contractor’s performance,” according to the FAR. Both sides would need to agree to the requirements in writing before any work begins. Such a practice would go a long way to conforming to the better business practices recommended by the GAO. The Defense Department “should also develop a knowledge-based business case that matches requirements with proven technologies, design knowledge and available funding,” the GAO asserted. While the GAO was only writing about aircraft in this report, the same ideas can be applied to other systems as well. But the devil is in the details, as the saying goes. 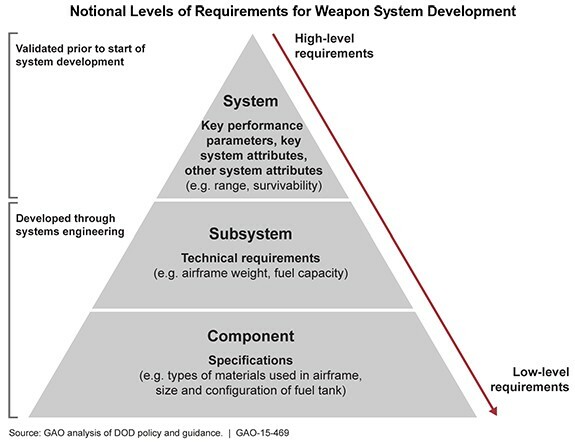 While the major requirements, like how far a new tank can drive, rarely change, the lower-level requirements are often changed through the development process. An example of this would be whether to use a diesel or turbine engine in the tank. These lesser requirement changes tend to have the most impact on costs. These types of changes generally occur after the contractor begins to really develop the new system, when the engineers take the major requirements and “translate them into technical weapon system-level requirements and contract specifications,” according to a recent GAO report. In other words, when engineers make the leap from what the system should do to how the system will do it. The GAO report recognizes the importance of identifying these more detailed requirements prior to the decision to award a contract. A performance bond could provide a powerful incentive to make this happen by establishing realistic requirements that are agreed upon by the government and the contractor and guaranteed with bond money. In like fashion, a performance bond could also affect another major source of cost overruns: the practice of front-loading weapons programs. Front-loading programs is a long-ago perfected process whereby contractors coax seed money from willing accomplices in Congress by over-selling the new system’s capabilities while at the same time underestimating its eventual cost. This works in tandem with the other major “Defense Power Game,” political engineering, where the contractor spreads subcontracts and jobs into as many Congressional districts as possible to ensure the program has adequate political support on Capitol Hill. Veteran military reformer Franklin “Chuck” Spinney explained that this is all part of “business as usual” when buying weapons in Washington. With a definite financial penalty looming, contractors would have a powerful incentive to not over-promise what is technically feasible and their ability to deliver at a lower cost than their competitors. This problem is particularly acute with more complex systems. Questions are currently being raised about Northrop Grumman’s B-21 bid. The Congressional Research Service recently challenged the Defense Department’s original $546-million-per-plane cost estimate after the winning bid came in far shorter. Officials have so far refused to release details of Northrop Grumman’s B-21 contract despite requests from members of the armed services committees. POGO encourages citizens to write to their members of Congress to demand the cost of the B-21 bomber contract. Reasonable readers are no doubt asking themselves — if performance bonds are such a good idea, why aren’t we doing this already? The answer to that most basic of questions actually seems rather simple. Most decision-makers don’t know this option is available. POGO consulted numerous acquisitions experts in the course of this investigation, some with more than 40 years of individual experience. Most had never considered using a performance bond for a weapons acquisition program. “I spent four years in the [Defense Department] Acquisition Executive’s organization in the late 1980s, where I was responsible for development and implementation of the department’s acquisition directives and decision processes,” said Tom Christie, former Director of Operational Test & Evaluation. But of course, any reform is only as good as the people enforcing it. Over the years, many reform measures have been put into place only to be undermined by people either issuing waivers to some requirements or wholly ignoring others. This of course could take place with a performance bond. A closer look at the fine print of Standard Form 1418 reveals a provision for the government to grant contractors extensions to the contract terms. So even if bonds are used, the programs still require rigorous oversight by strong, ethical individuals. While there is no silver bullet when it comes to reforming the broken weapons buying process, performance bonds hold the potential for solving some of the root causes of busted schedules and ballooning budgets. At the very least, they would raise the level of accountability by making contractors put their money where their mouths are. This story originally appeared at www.pogo.org.